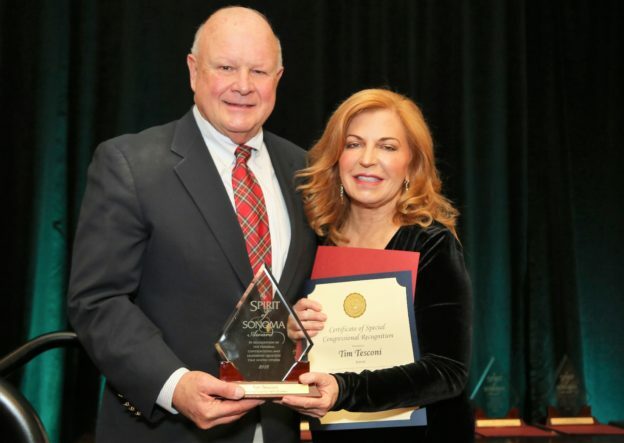 Past Sonoma County Farm Bureau Executive Director and all-around friend to the agriculture community, Tim Tesconi, received the Spirit of Sonoma Award on December 14. The event sponsored by the Sonoma County Economic Development Board was held at the Double Tree Hotel in Rohnert Park. Tesconi was recognized alongside 21 other recipients at the annual awards ceremony. The Spirit of Sonoma Awards recognizes the leadership and positive contributions that business and agriculture leaders, chambers, and trade groups give to our local economy and community. To date, almost 400 individuals have been awarded the Spirit of Sonoma Award. 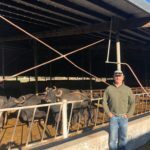 Tim Tesconi has dedicated his life to the promotion and advancement of agriculture in Sonoma County. Born and raised on a small family farm in west Santa Rosa, Tesconi is passionate about Sonoma County agriculture. Throughout his career Tesconi has worked diligently to tell the story of agriculture and to support the next generation of agriculturalists, embodying the Spirit of Sonoma County. A self-described “ag nerd”, Tesconi has been involved with agriculture his entire life. His real interest in agriculture was sparked by Wes Jamison, Tesconi’s ag teacher at Santa Rosa High School. Tesconi said Jamison had a knack for finding kids and guiding them like an old sheep dog to get involved and become leaders in the ag industry. Inspired by his ag teacher, Tesconi attended Chico State after graduating from high school and planned to become an agriculture instructor. However, after a year of student teaching, he realized it wasn’t the career for him. Tesconi’s roommate was a journalism major who quickly influenced his career path. After earning a master’s degree in journalism from the University of Missouri, he returned to Santa Rosa and embarked on his career crating compelling stories about local farmers and ranchers and agricultural issues for the Press Democrat. In total, Tesconi had a 33-year career writing about North Bay agriculture. Upon retirement from the PD, he continued advocating for local agriculturalists and served for 10 years as the community relations coordinator and then executive director of Sonoma County Farm Bureau. Tesconi retired after 43 years of service to the agriculture industry in the fall of 2015. Although no longer with the Farm Bureau, Tesconi still writes stories that educates and entertains readers about the local farming community. In 2016, he was inducted into Sonoma County Farm Bureau’s Hall of Fame. The award recognizes prominent members of the community for their commitment to preserving and protecting agricultural land throughout the county. Executive director Ben Stone and his volunteer board launched the EDB’s Spirit of Sonoma Awards in 2000. The original idea was to create an annual pause from the busy agenda of local industry, government and commerce to acknowledge some of the men and women who “make a difference.” Stone described Tesconi as, essentially, a living legend in the agriculture community as well as in the broader business and government communities of Sonoma County. Even after his retirement, Tesconi is still heavily involved in the agriculture industry. He sits on multiple boards including the 4-H Foundation of Sonoma County, Sonoma County Farm Trails and the Santa Rosa Junior College Ag Trust. He is involved with planning the AgStravaganza and is working with the Healdsburg Museum on cleaning up the historical Oak Mound Cemetery. Tesconi and his wife Cathy have two children. Sam works in the Sonoma County wine industry, and Will works for a non-profit based in Denver doing work in Africa.